Those who know me, understand I am a fan of geranium. Not only is it the common denominator in the vast majority of my favourite scents, but geraniums have always been around me - potted pelargoniums decorated our balcony when I was a child, and I have come to associate their aroma with good times. 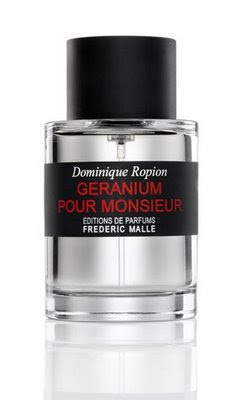 Some might thus understand my excitement when I learned of the imminent Frederic Malle release Geranium Pour Monsieur: the new creation by accomplished nose Dominique Ropion. Slotted for release in May 2009, there are still several weeks before I can sample this scent - it will be a gruelling wait. In the meantime however, here are details on the olfactory pyramid, and Frederic Malle's own reflections on the creation of Geranium Pour Monsieur. "My main inspiration when working on my Anterenea soap was the scent of the old-fashioned luxury soaps of my childhood. It is while creating this formula that I rediscovered the clean sophistication of geranium and promised to make this oft-forgotten raw material the leading part in a future perfume. After talking through my idea with perfumer Dominique Ropion, we realized that using geranium essence as the main component of a masculine fragrance was the ideal way to create a clean, brisk alternative to the all-too mundane fern-type smells that dominate men’s perfumery. Furthermore, by mixing geranium with aniseed and a cocktail of new, very refined musks, we generated the long-lasting freshness that most men desire, but in a far more sophisticated way. The main components of this new breed of men’s perfume quickly emerged: geranium from China, rhodinol (a fresh-smelling raw material extracted from natural Chinese geranium), mint, aniseed, spices such as clove and cinnamon, sandalwood, and a large dose of white musks. The formula also contains notes that, although natural, represent the latest in technology: its cinnamon, for example, was extracted with CO2, and its mint is a specific molecularly distilled mint absolute. This new breed of raw materials brings together the beauty of nature and the precision of the digital era. The above notes give the fragrance a feeling of purity and freshness, so to increase the depth and sophistication of the new composition, Dominique added deeper, more exotic notes like incense resinoïd and styrax benzoin from Siam. I hope that you will agree that “Geranium pour Monsieur” is a new alternative for men seeking ultra-chic freshness." I can't wait as soon as it's out I shall order a sample from "Les Senteurs" . I look forward to reading your review . I am afraid that I might fall hard for this one..
How many words to avoid to quote the "toothpaste" effect of this perfume, wich remains a little marvel on its own. Geranium pour Monsieur is "strong" in the most pure and unashamed way. There are too many fern, fresh, or mossy vetiver etc... so many cliché among masculine scent. Geranium pour monsieur appears to me like an icy crystal new kind of masculinity : so strong, so icy, unpenetrable, though pure and see-through. Past the "Is someone chewing a minty gum ?" you realise that the great quality of ingredients, and the important play of geranium in it.